Okay! Musume Time: The Oath of "Z" no Chikai! - Momoiro Clover Z Single Review! The Oath of "Z" no Chikai! 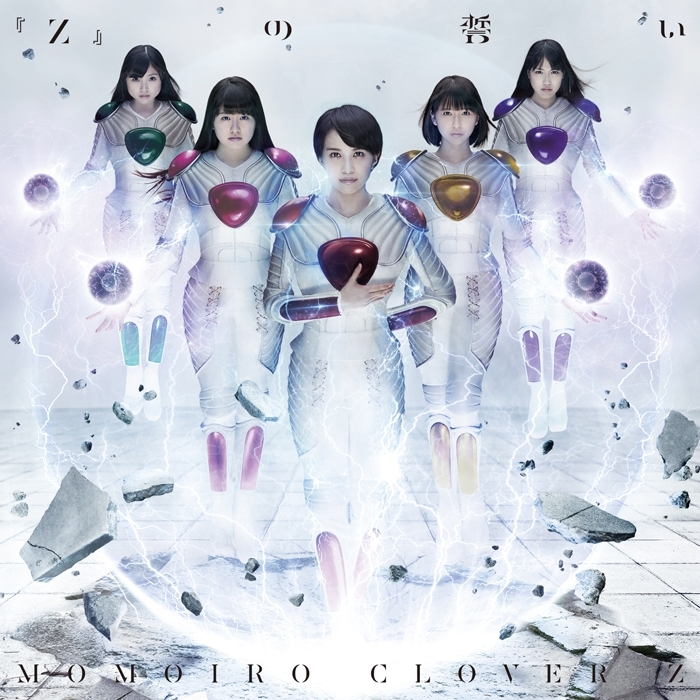 - Momoiro Clover Z Single Review! Let the fandom roar! Dust off those cosplay outfits you've been hiding away until the next convention creeps up, let the excitement surge through you, and get ready for the power to go well over 9000! It's time to begin an adventure, and entertain ourselves with a little bit of Momoiro Clover Z! It's been a good few years since we last saw them here, but it's time! Will I finally change my mind on this group, and give them the good ol' college try? Or will MCZ continue to fall below my radar, and forever dwell in outer space, where I'm currently keeping them? Let's review and find out. Courtesy of Tanera, I will finally be reviewing something Momoiro Clover Z related. It rarely happens here, due to my insistence that I don't care about the group, as well as my stubbornness to actually listen to what they have to offer. I mean, the last time I even talked about them was during my Christmas 2016 posts, and that was only to add their annoying, sugar-cookie Santa-san track for the sake of Christmas joy. So, yeah, it's been a fair while since I last did something MCZ related. Now, given the fact I don't actually listen to this group a whole lot, I'm going into this a little blind. So far, I've only heard "Z" no Chikai itself, but the coupling tracks are a mystery to me. So, this is a review as I listen kind of deal, and honestly, I'm hoping that my opinions on the remaining tracks differ greatly from the opinion I've already formed on the A-side. You never know; I could come out of this really enjoying MCZ's b-sides, and thinking of them differently. There's always that possibility. I'll probably still be on the fence, but hey! This could be the review to open me up to the possibility of listening to more of their music, and finally jumping into the Stardust pool. I know quite a few friends who would happily greet me on that side of the fence, and show me what's good and what's moderately tasteful. SO, after quite a few years (five, actually), I am going to be reviewing some Momoiro Clover Z! And no, I don't want to, but this is a request, and I said I would do it! And who knows? I could come out of this enjoying the single and all it has to offer, and maybe more. So, let's get ready to look at some Momoiro Clover Z, power up, and blast this single at full volume! Prep the earplugs, people. This could get shrieky. At first, I hated this song, but as it stands now, I'm about 50/50 when it comes to "Z" no Chikai. It's pretty much been confirmed in my mind that the verse is absolutely atrocious, but the chorus and Kanako's solo in the bridge are actually enjoyable. So, it's actually difficult to decipher whether I enjoy this, or if I actually really dislike it, because I'm so half/half on the song itself. Well, at least there is something enjoyable about it, plus I do like the intro. It's just that horrible, bland verse and the boring first bridge that I can't stand. The rest of it is pretty decent, though. The music video is, of course, interesting. It's an MCZ video, for crying out loud, and even I'm not blind to how amazing their videos can be. 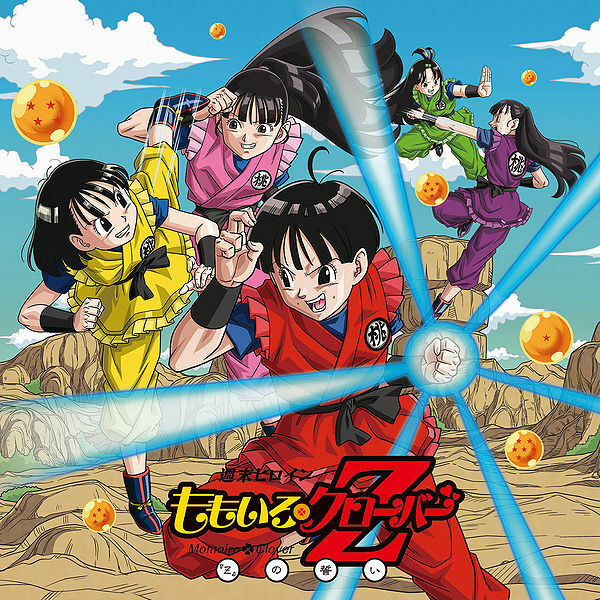 This one is a complete nostalgia trip, though, because it's all Dragon Ball Z goodness, and damn, that was a core part of my childhood. So, yeah, this MV is all kinds of epic, and I really dig the short, red hair on Kanako, and Shiori's awesome, almost manly look. The background and effects are really cool, too, giving us a slice of animation mixed with the live action members. Y'all don't know how pleased I am that this wasn't just filled with DBZ animation, cause dude, Moon Pride's MV pissed me off. It wasn't even a real MV, in my mind. So, yeah, awesome music video, with a sub-par song to tie it all together. Again, the chorus and Kanako's last solo in the bridge are great, and I'm honestly surprised I enjoy the bridge that much; I usually hate Kanako's voice, but she sounded great here. In general, they did a good job, but I feel like a more powerful, energetic song would have definitely benefited them. This one doesn't really do the group justice, and again, it's a bit of a bland one at times. Ah, well. To me, it's an okay song, but it's pretty weak, too. I honestly wouldn't have thought this would be the title track to the DBZ movie that was released 2015, because again, it's such a weak track, and it really doesn't fill me with excitement or anticipation like Moon Pride did. Still, it has a few good points, but not enough to make me want to listen to the song on repeat. Okay, this track is definitely more up my alley, sound wise. It's a lot cuter, and though it isn't as energetic as I would probably like it to be, it has a nice bounce to it. Romantic Kongara Gatteru is so much sweeter, with a nice soft tone that actually suits MCZ quite well. I'm so used to them being hyperactive, shrieky and out there, to the point it puts me off, that I've not really taken the time to check out any of their other stuff to see this side to them. And yes, it's surprisingly pleasant, though a little weird for me. Again, I'm used to them being outlandish and pitchy. It's so old-school Idol, and that's what I like about it. Plus, it throws a little surprise in there during the bridge, treating us to some cute, light rapping. It gives the song such a boost, plus it surprises you when you first hear it. An unexpected addition, but a good one, at that. It's really enjoyable, and probably my favourite part about the whole song. This is a nice little track, and it works well as a b-side, however I won't lie and say that I will remember this song; I most likely won't. I definitely think it's adorable, and I am entertained by it a great deal, but I also know that this track may never get stuck in my head like others have before. Still, for one or two listens, this is a nice little tune to bob your head along to, and it's such a pleasant, sweet sound. Sadly, it's also not that memorable, aside from the bridge. Well, if I do remember it, then we can say I was wrong. For now, though, I feel like I'll forget it once I put SHAMROCK on, or something. It is how it is. A cover of the original Dragonball Z opening from way back when (1989), I have to say, this is a damn nice update of the song. Though the vocals leave a something to be desired at times - Kanako's opening line was a tad weak - I think that MCZ gave this song their all, and they lived up to the original quite nicely. Of course, there are quite a few differences between the two. Firstly, I do think the original has a lot of 80's charm which can never be replaced, whilst MCZ's version has a little more pzazz and jump to it. The style that Momoiro Clover Z have adopted for this track allows it fit into the modern style of J-pop tracks a lot better, too, but I don't think their vocals are on par with Kageyama Hironobu's. He had such a distinct voice, with a charming softness to it. That said, MCZ's vocals give this song such a boost, with each member delivering a different tone and power to their solo lines. I praise them for bringing their energy into this song, and it fits the overall tone very well. I think that CHA-LA HEAD-CHA-LA is the winning track on this entire single, and I can only put that down to it being an older song that, even way back when, was a solid track. It's quality is still apparent, even when it's been updated to fit the current sound of the music scene, and honestly, it puts "Z" no Chikai to shame. From beginning to end, CHA-LA HEAD-CHA-LA is promising, and it is so much catchier than all of the other tracks. Of all three, I'd probably remember this one so much more. It's a good track, and Momoiro Clover Z did really well when singing it. I'm just a bit bummed out that the A-side can't even stand up to this one in any way, but sometimes, that's the way it is. We can't always beat out the old with the new, aye? I would not go as far to say that this is a good single, for me, at least. It has its charm, with a cute b-side track and a really well done cover, but the A-side is currently a lost cause. Though there are aspects of the leading track that I enjoy - Kanako's solo in the bridge, the chorus itself - I can't help but feel that the rest of the song is just horrible. It isn't appealing, and I doubt it ever will be, which is a shame, because Momoiro Clover Z did such a good job with Moon Pride. You can't win at everything, though, and whilst I'm sure that there are people out there who adore this release, and think very highly of the song, I'm just not convinced. The other two tracks, well, they're pretty good. Romantic Kongara Gatteru is cute and appealing, but after listening to CHA-LA HEAD-CHA-LA, I've completely forgotten it. Speaking of the final track, it is definitely this singles saving grace. It's energetic, entertaining, and everything I hoped the title track would be. Alas, this is also a cover, meaning that the one song that was actually worth anything on here, isn't even the groups own creation. That's a little sad. Well, it can't please everyone now, can it? I would give it 2 and a half stars, but how the heck do I make a half star? URGH! Ouch. I may be a little harsh, but honestly, this single isn't doing anything for me, aside from the bonus cover track. I'm hoping that I can rectify this rating in the next MCZ review (yup, there's another one! ), because I generally like what I review (a far cry from my reviews in the past, ha), and I don't really go below three stars. So, I'm hoping the next single I look at will turn my head and make me give you all a positive review on a Momoiro Clover Z single release. This time, however, it's not so positive. I just don't care for "Z" no Chikai, and right now, I'm glad this review is over and done with. Now I can get back to the music I actually like, before focusing on the next review I bring to you all. Now, can Frieza come and destroy this piece of garbage? That'd be greeeeeeat. Hopefully, come the next review, I will have a totally different opinion coming your way. I may have no interest in Momoiro Clover Z, but that doesn't mean I hate them, or want to dislike what they bring out. Seriously, if they can make me interested and keep me looking out for them, I'll be happy. I like Idol groups, I like music, and I like the variety. I just need a hook, and MCZ have yet to provide that for me. Until the next one, lovely readers. Take care, and love those Idols (especially the ones that I don't)!